The fringe is big news for 2018 and we say the bigger the better. If you want to create volume in the fringe then simplicity is key. You can easily create body and volume, whilst keeping plenty of natural movement for a fringe that looks fabulously full! When it comes to styling, we believe in damage limitation. Too much heat on the hair leaves it looking frazzled. For maximum impact, the fringe should look healthy and full and shiny. When it comes to creating volume, body or texture in hair we rely on two simple tools. 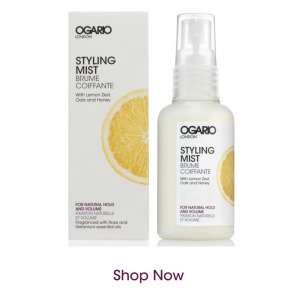 The Ogario London Styling Mist for Natural Hold and Volume, a super-lightweight mist developed to leave hair full and give hold without any residue or stickiness, along with our favourite volume-boosting Velcro rollers. Wash and condition your hair with the right shampoo and conditioner for your hair type. Take the excess water out of your hair with a towel. Hair should be damp but not dripping wet. 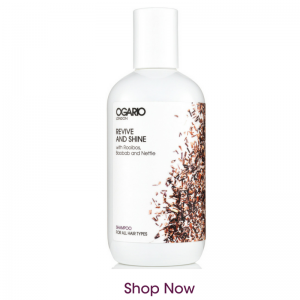 Spritz 2 to 3 pumps of Ogario London Styling Mist for Natural Hold and Volume in the hair. The super-lightweight mist can be sprayed above the head to fall on your hair, or directly on to the hair. Keep at a slight distance so that it spreads in the hair. Less is more. Leave for a few seconds and comb or brush through the hair. Blow dry as normal, ensuring you don’t over dry the hair. Hair should still be warm. Put the Velcro rollers on the top of the head where you want to create body with a couple of small rollers in the fringe. Leave for 10 to 15 minutes allowing the hair to cool. Gently remove the Velcro rollers and use your hands to finish the style. A light touch helps, as this look should be slightly mussed up with plenty of natural movement. Looking for more Tips on Volume and Styling?